No Need to Upgrade: If you’re happy with Windows 7 and your laptop computer, there is no need to upgrade. There’s nothing in Windows 8 that is important for you to have. When you get a new computer, get Windows 8 then. 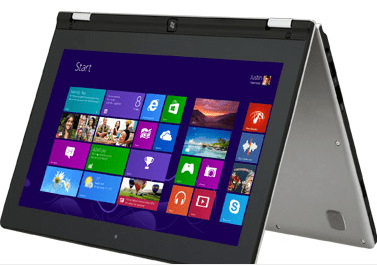 To get the full experience of Windows 8, you want a touchscreen device. Of course, if you like to be challenged and to play with the latest and greatest – go for it! Windows 8 should run just fine on any computer that has been running Windows 7 well. Here are Microsoft’s specs on upgrading to Windows 8. My favorite new feature is how it is integrated with the Skydrive cloud. A Brand New World: The big deal about Windows 8 is that it combines the best of both worlds. Right now you have your iPad or other tablet or your smartphone for comfortable browsing and emailing while sitting on the couch. Then, you still need your trusty laptop for using Word, Excel, Powerpoint, and other Windows software like Quicken, Picasa, or Streets and Trips. The promise of Windows 8 is that it makes possible a touchscreen tablet that can also run your long-time trusted PC software. Microsoft is betting on Windows 8 being a game-changer - computers as we know them are gone. Windows 8 opens the door for a whole new way of working with computers – where the big screen on your desk has the exact same software/apps as the tablet and smartphone. We are excited about the possibility of a tablet that will run Microsoft Streets and Trips, so we could easily use it for navigation as well as trip planning. But that day isn’t here yet – see #4. Expect a Learning Curve: Windows 8 is different. You can’t just turn it on and start using it like with past versions of windows. There is no ‘Start’ button, you’ll need a lesson on how to get around. It is two computers in one – a touchscreen, active tiles motif computer which feels like a smartphone or tablet complete with special apps. Each tile is more like a widget than an icon, the tile for your email app, for example, will display your latest emails and actively change when new email arrives. Although you can get to a screen that looks like the classic Windows desktop, it’s not apparent how to get there. Here is David Pogue’s Windows 8 Cheat Sheet which will give you some basics. Windows RT is not Windows 8: If you like the idea of a tablet being the only computer you need, you may be tempted to buy the new Surface tablet that Microsoft is selling starting Oct 26, 2012. Don’t do it! The Surface that goes on sale today is not running Windows 8, it is running Windows RT which is just the touchscreen/tablet/App version meant for the current crop of tablet ARM processors. Windows RT does have the 2013 versions of Word, Excel, Powerpoint, and One Note, but it will not run your other Windows software like Quicken, Picasa, or Streets and Trips. You need to get a tablet with an Intel processor, running the full-blown Windows 8. Microsoft is promising a Windows 8 Surface Pro tablet in January and other vendors plan Windows 8 tablets even sooner. For more details, read this CNN Money article: Windows 8 vs Windows RT. For a complete review and everything you’d want to know and more, check out the CNET Review of Windows 8. Published by MrsGeek, in Blog. Tagged with Skydrive, Surface, Windows 8, Windows RT.